We can all agree that a common worry of all eLearning professionals is to create highly engaging, interactive eLearning content and activities for their learners. On top of that, saving eLearning course development time, reducing costs, and dealing with multiple members of the eLearning team with different levels of expertise are only some of the hassles that affect eLearning professionals every day. Dealing with all these problems at the same time may sound overwhelming, but eLearning templates seem to be the lifesaver eLearning professionals need. It's a common secret for everyone involved in the process of eLearning design and development that the quickest and easiest way to create eLearning content is through the use of ready-made eLearning templates. This occurs because, in most cases, eLearning templates serve as blueprints on how to build eLearning content in order for eLearning professionals to develop eLearning deliverables that are effective, look professional, while at the same time they engage the audience by providing lots of opportunities for interaction with the eLearning content. In this article, I'll discuss the top 9 benefits of using eLearning templates all eLearning professionals should be aware of. eLearning Templates save development time. Using eLearning templates make it faster and easier for you to create eLearning courses, because they eliminate the need to develop eLearning from scratch. 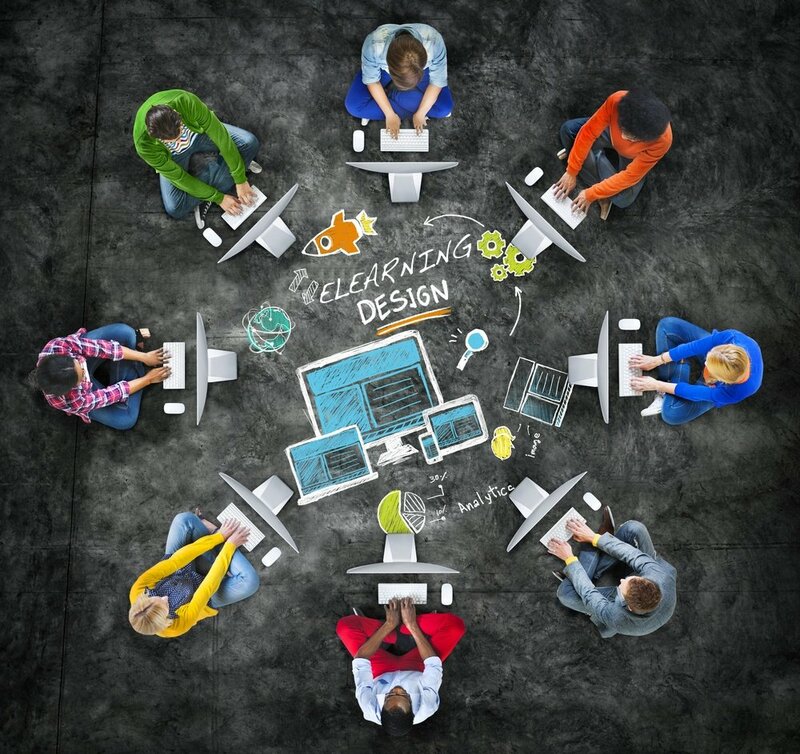 The eLearning content instructional designers receive, has often common elements such as definitions, procedures, and specific presentation patterns; therefore, developing fixed eLearning templates that contain these elements, eliminates the need to develop them from the very beginning every time you need to present the same type of eLearning activity. Having ready-made eLearning templates means that you can produce eLearning courses in significantly less time it would originally take you to develop your eLearning course. This is due to the fact that eLearning templates consist of a series of slides, rather than a single one. However, there is one main slide, the “Master Slide” that serves as the basic layout which provides uniformity in terms of colors, structure and navigation options. Making changes to the Master slide automatically updates all the rest of interconnected slides as well. By selecting the appropriate eLearning Master template and the respective interactive slides that accompany it allows eLearning professionals to focus more on the eLearning content itself, rather on how to make technical arrangements with respect to how the eLearning content will appear on screen. eLearning Templates significantly reduce development cost. Standardization of components enables you to reuse the same eLearning templates as many times as you want, reducing development costs. Also, consider visiting any of the eLearning template libraries available online, where you can choose from a wide variety of template layouts, such as games, interactive scenarios, etc. This can significantly reduce you production cost. eLearning Templates are easy to use. eLearning templates make it possible for any eLearning professional to design eLearning content by having access to online libraries of free eLearning templates and thus being able to choose from a diverse set of preconfigured interactions, without needing to program or design anything. With respect to the look and feel of the eLearning template, the infinite collection of unique and ready-to-use designs, patterns, layouts, sizes, etc, that are available on the internet are just a click away, and their application is not only easy, but also a fun way to experiment as you have a variety of different options to choose from. You can either make your choice from the countless resources available on the web, or you can download an authoring tool that will help you develop your own customized templates, exactly as you like it. Customized, reusable eLearning templates meet your design needs, from image size requirements to interactivity. You just have to import your eLearning content by copying and pasting it in the eLearning template or by a simple drag and drop move. eLearning Templates provide opportunities of interaction and engagement. eLearning templates enable you to create different page layouts to meet the different needs of your audience. While the look and feel of the eLearning courses remain the same, customized templates motivate learners to take up the eLearning course, because they have been designed to offer variety in order to meet the needs and preferences of different types of learners. As no eLearning template is the same with another, this decreases the likelihood that learners get bored. In addition, the integrated features they offer, give eLearning professionals the opportunity to make minimum changes by simply customizing the eLearning template to the training needs of their organizations. In addition, the fact that all available eLearning authoring tools offer an integrated audio recording tool extends the potential of eLearning templates and makes the life of eLearning professionals easier. This integrated audio recording tool, combined with the extensive use of multimedia features and graphs eLearning templates include, gives eLearning professionals the opportunity to provide their audience both with visual and auditory eLearning content, which has been proved to have a positive effect on learning. eLearning Templates enable course overview in a single slide. Another great benefit eLearning templates offer is the use of a single slide, as a point of reference for the entire eLearning course. In contrast to static templates, eLearning templates enable learners to learn more about each option offered in the eLearning course without getting transferred to a distinct location. The new information appears as a component of the big picture; as a piece of puzzle that comes to fill in specific knowledge gaps of the learners.Throughout the learning process, learners are always aware of where they stand in terms of the entire eLearning material, what they have covered so far, and what is still missing. By having in front of them an overview of the eLearning course, they get a better understanding of how concepts are interrelated and why they are asked to learn each particular piece of new information. In addition, they are able to better connect this new material with previous knowledge or what they have learned from the eLearning course so far, as they create “mental associations” that not only facilitate the assimilation process of the eLearning content, but also the process of retrieving relevant parts of the information later on, when needed, which increases knowledge retention. From an eLearning professional point of view, the use of eLearning templates as a single point of reference of how various eLearning content elements are interrelated, allows them to organize the information in a meaningful way. Designing and developing an eLearning course is a team work and usually every member of the group has different taste and preferences with respect to how the eLearning template should look like. This may cause an inconsistency in terms of presentation, which sometimes proves to be quite problematic. Uniformity is a vital part of any eLearning course that helps learners not to doubt about how to navigate within it. eLearning templates increase consistency regarding the look and feel of your eLearning course by providing standardized pre-defined colors, fonts, logos, sizes and layout, all of which result in a high quality eLearning course. Furthermore, using a customized template that has been created exclusively for your company reflects your brand more effectively. How many times have you postponed completing the design of your eLearning course while trying to figure out how to place the different elements of your eLearning content and visuals? The huge amount of resources available enables you to choose a ready-made eLearning template or to design a customized one of your own. By choosing from the several eLearning authoring tools available, you have absolute control and unlimited possibilities over the ways you can adapt your eLearning content in order to meet different needs of the audience. All you have to do is organize everything according to the eLearning template you choose. This means that you have absolute freedom to develop your eLearning course in the form you like it best. Accessing eLearning templates libraries offers any eLearning professional tremendous flexibility, as they are able to choose from a very diverse set of preconfigured interactions. After you decide which eLearning template to use, you have immediate control over the look and feel of the output of the eLearning course by designing the page the way you like it, format it as required and add any media type, such as animations, videos, images and tables within the eLearning course page. eLearning Templates give you the opportunity to focus on the eLearning content. eLearning templates offer you the opportunity to be sure that the way you present the information of your eLearning content is effective, as most templates have been tested before, so they are based on solid instructional design models and theories and eLearning best practices. No matter how enthusiastic or creative an eLearning professional may be, sometimes he or she may find it difficult to come up with new ideas for presenting the eLearning content. All you need to do to make your eLearning courses look professional and unique is simply choose the eLearning template that suits you best. With eLearning templates you don't have to worry that an annoying software malfunction in the eLearning template you use may totally ruin your eLearning course. Ready-made eLearning templates have passed through various tests in different eLearning platforms before they are released in order to eliminate programming bugs and ensure software consistency. This secure framework in which eLearning templates work make them even more powerful tools, fact that largely reduces the stress levels of novice eLearning professionals and makes them feel more confident when experimenting at the development phase of their eLearning deliverable. Never use eLearning templates that are too complicated in terms of structure or navigation. As a rule-of-thumb the most effective eLearning templates are the ones that include three to four interactive options. Also, prefer eLearning Templates that learners will find easy to navigate in. Check the flow behind eLearning templates. This has to do with how the Master slide is interrelated to the rest of slides. Is it the type of flow you really need? Is it too complicated? Check the respective authoring tool’s options and decide upon the degree of linearity or free navigation control level you will allow the learners. Prefer eLearning templates that offer integrated feedback sections. Give learners the opportunity to learn from their own mistakes by following a learning-by-doing approach. Always provide feedback for each alternative option. Explain why an answer is correct or incorrect or the consequences of the option selected by a learner. Promote branching scenarios by challenging learners to make decisions in order to proceed to the next step. Also challenge them to navigate through alternative options in order to examine “what-if” scenarios. Before choosing multimedia eLearning templates, make sure you have all the assets you need. Unless, for example, you have a professional video to upload, do not opt for an eLearning template that is based on video projection. The same applies to graphics. Also, take into account time and budget constraints. Never choose eLearning templates just for the sake of interactivity if they do not meet the requirements of your eLearning course. Always try to keep in mind that the ultimate goal when choosing eLearning templates is to create eLearning content of value that meets the learning objectives of the eLearning course. Using ready-made and/or customizable eLearning templates greatly improves your productivity and enhances the overall quality of your eLearning courses. Without any doubt, eLearning templates are quite useful in the hands of all eLearning professionals, no matter how much experience they have, as they consist the quickest, the safest and perhaps, the most effective to develop high quality eLearning courses. If you would like to wrap up your eLearning templates with attracting descriptions on the eLearning courses you have created, read the article 7 Tips To Develop Attention Grabbing eLearning Course Descriptions to learn some very useful tips on how to emphasize on the real world benefits and applications of your eLearning course.